On July 2, 1937 (midnight GMT) Earhart and Noonan took off from Lae in the heavily loaded Electra. Their intended destination was Howland Island, a flat sliver of land 6,500 ft (2,000 m) long and 1,600 ft (500 m) wide, 10 feet (3 m) high and 2,556 miles (4,113 km) away. Their last known position report was near the Nukumanu Islands, about 800 miles (1,300 km) into the flight. The United States Coast Guard cutter Itasca was on station at Howland, assigned to communicate with Earhart's Lockheed Electra 10E and guide them to the island once they arrived in the vicinity. Through a series of misunderstandings or errors (the details of which are still controversial), the final approach to Howland Island using radio navigation was not successful. Fred Noonan had earlier written about problems affecting the accuracy of radio direction finding in navigation. Some sources have noted Earhart's apparent lack of understanding of her Bendix direction-finding loop antenna, which at the time was very new technology. Another cited cause of possible confusion was that the USCG cutter Itasca and Earhart planned their communication schedule using time systems set a half hour apart (with Earhart using Greenwich Civil Time (GCT) and the Itasca under a Naval time zone designation system). During Earhart and Noonan's approach to Howland Island the Itasca received strong and clear voice transmissions from Earhart identifying as KHAQQ but she apparently was unable to hear voice transmissions from the ship. At 7:42 a.m. Earhart radioed "We must be on you, but cannot see you—but gas is running low. Have been unable to reach you by radio. We are flying at 1,000 feet." Her 7:58 a.m. transmission said she couldn't hear the Itasca and asked them to send voice signals so she could try to take a radio bearing (this transmission was reported by the Itasca as the loudest possible signal, indicating Earhart and Noonan were in the immediate area). They couldn't send voice at the frequency she asked for, so Morse code signals were sent instead. Earhart acknowledged receiving these but said she was unable to determine their direction. 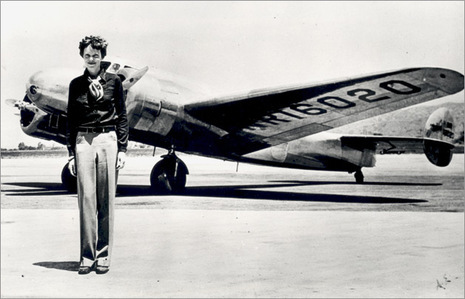 In her last known transmission at 8:43 a.m. Earhart broadcast "We are on the line 157 337. We will repeat this message. We will repeat this on 6210 kilocycles. Wait." However, a few moments later she was back on the same frequency (3105 kHz) with a transmission which was logged as a "questionable": "We are running on line north and south." Earhart's transmissions seemed to indicate she and Noonan believed they had reached Howland's charted position, which was incorrect by about five nautical miles (10 km). The Itasca used her oil-fired boilers to generate smoke for a period of time but the fliers apparently did not see it. The many scattered clouds in the area around Howland Island have also been cited as a problem: their dark shadows on the ocean surface may have been almost indistinguishable from the island's subdued and very flat profile. The last voice transmission received on Howland Island from Earhart indicated she and Noonan were flying along a line of position (taken from a "sun line" running on 157–337 degrees) which Noonan would have calculated and drawn on a chart as passing through Howland. After all contact was lost with Howland Island, attempts were made to reach the flyers with both voice and Morse code transmissions. Operators across the Pacific and the United States may have heard signals from the downed Electra but these were unintelligible or weak. Some of these transmissions were hoaxes but others were deemed authentic. Bearings taken by Pan American Airways stations suggested signals originating from several locations, including Gardner Island. It was noted at the time that if these signals were from Earhart and Noonan, they must have been on land with the aircraft since water would have otherwise shorted out the Electra's electrical system. Sporadic signals were reported for four or five days after the disappearance but none yielded any understandable information. The captain of the USS Colorado later said "There was no doubt many stations were calling the Earhart plane on the plane's frequency, some by voice and others by signals. All of these added to the confusion and doubtfulness of the authenticity of the reports." 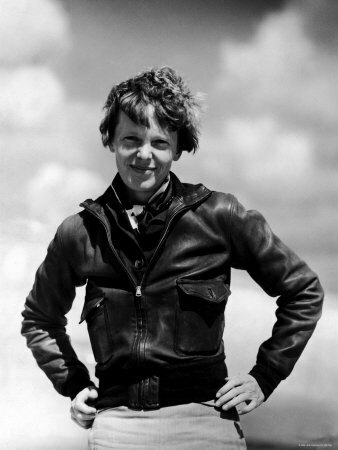 On July 2, 1937 at 0000 GMT, Earhart and Noonan took off from Lae. Their intended destination was Howland Island, a tiny piece of land a few miles long, 20 feet high, and 2, 556 miles away. Their last positive position report and sighting were over the Nukumanu Islands, about 800 miles into the flight. The U.S. Coast Guard cutter USCGC Itasca was on station near Howland, assigned on short notice to communicate with Earhart's plane and guide her to the island once she arrived in the vicinity. But it soon became evident that Earhart and Noonan had little practical knowledge of the use of radio navigation. The frequencies Earhart was using were not well suited to direction finding (in fact, she had left behind the lower-frequency reception and transmission equipment which might have enabled Itasca to locate her), and the reception quality of her transmissions was poor. After six hours of frustrating attempts at two-way communications, contact was lost. A coordinated search by the Navy and Coast Guard was organized and no physical evidence of the flyers or their plane was ever found. 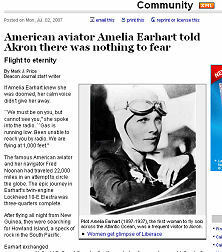 Earhart and Noonan's fate has been the subject of many rumors and allegations which were never substantiated. 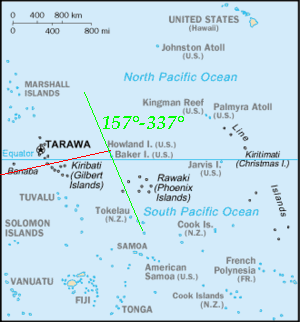 Modern analysis indicates that after passing the Nukumanu Islands, Earhart began to vector off course, unwittingly heading for a point about 100 miles NNW of Howland. A few hours before their estimated arrival time Noonan calculated a "sun line," but without a successful, radio-frequency range calculation, a precise "fix" on the plane's location could not be established. Researchers generally believe that the plane ran out of fuel and that Earhart and Noonan perished at sea. At 10am local time, zero Greenwich time on July 2, the pair took off. Despite favorable weather reports, they flew into overcast skies and intermittent rain showers. This made Noonan's premier method of tracking, celestial navigation, difficult. As dawn neared, Earhart called the ITASCA, reporting "cloudy, weather cloudy." In later transmissions earhart asked the ITASCA to take bearings on her. The ITASCA sent her a steady stream of transmissions but she could not hear them. Her radio transmissions, irregular through most of the flight, were faint or interrupted with static. At 7:42 A.M. the Itasca picked up the message, "We must be on you, but we cannot see you. Fuel is running low. Been unable to reach you by radio. We are flying at 1,000 feet." The ship tried to reply, but the plane seemed not to hear. At 8:45 Earhart reported, "We are running north and south." Nothing further was heard from Earhart. Amelia left Lae at precisely 00:00 hours Greenwich Mean Time on July 2. It is believed that the Electra was loaded with 1,000 gallons of fuel, allowing for 20-21 hours of flying. At 07:20 hours GMT Amelia provided a positon report placing the Electra on course at some 20 miles southwest of the Nukumanu Islands. The last weather report Amelia was known to have received was before take-off. The head wind speed had increased by 10-12 mph, but it is not known if she ever received the report. At 08:00 GMT Amelia made her last radio contact with Lae. She reported being on course for Howland Island at 12,000 feet. There is no real evidence as to the precise track of the aircraft after Nukumanu. No one saw or heard the plane fly over. At 20:14 GMT the Itasca received the last voice transmission from Amelia giving positioning data. The Itasca continued to transmit on all frequencies until 21:30 hours GMT when they determined that Amelia must have ditched at sea and began to implement search procedures. It has been determined that the plane went down some 35-100 miles off the coast of Howland Island. A life raft was stowed on board but no trace has ever been found the raft. Some experts felt that the empty fuel tanks could keep the plane afloat for a period of time.